This year we have several fun-filled spirit nights scheduled to help raise funds for the PTA. Check this page regularly for updated information and details for each event. 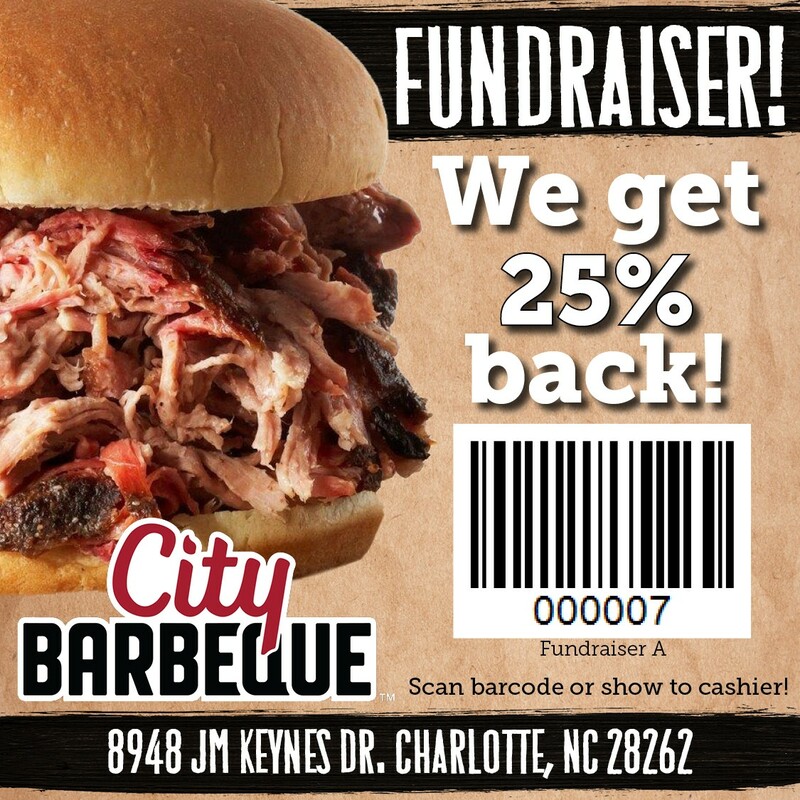 Join us at City Barbeque (University City Location) for food and fun. 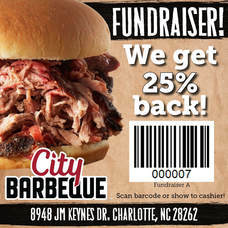 Visit the restaurant anytime on February 20th and present the coupon by phone or print-out, and City Barbecue will donate 25% of each sale to our school. Flyers will also be sent home with the coupon in Thursday folders prior to the event. Join us for our first spirit night at the Chuck E. Cheese location at Concord Mills. Chuck E Cheese will donate up to 20% of the sales generated from this event to Dorothy J. Vaughan. Each scholar will receive 10 free play points and CMS staff members will receive either a free personal pizza or salad and drink. Friends and Family members are encouraged to attend. Don’t forget to bring the flyer below so that you can take advantage of the coupons. Join us at Blaze Pizza on November 5 and help us raise funds. Present the flyer below (in print or on your cell phone) and Blaze Pizza will donate 20% of food sales, excluding alcohol to our DJV PTA. Funds from this event will be applied to our literacy efforts. 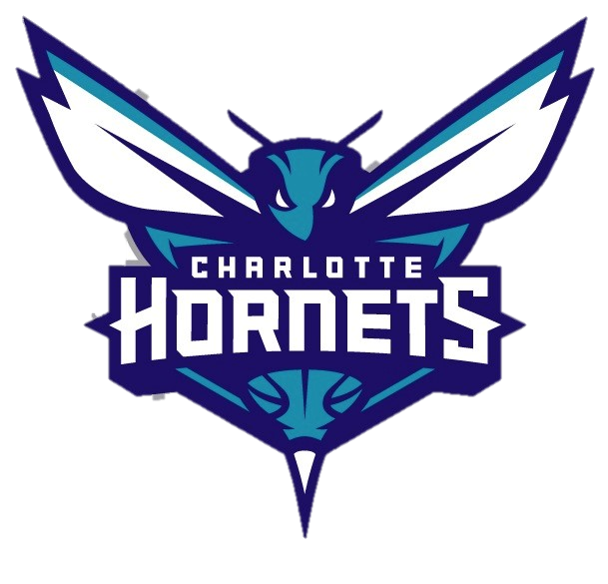 Come support Dorothy J Vaughan as the Charlotte Hornets take on the Philadelphia 76ers on Saturday, November 17th. Exclusive discounted tickets for all Dorothy J Vaughan school buyers as well as the chance to earn VIP access to pre-game shootaround with the sale of 50 or more tickets. This night highlights one of our classic night games where the Hornets will play on a special classic court based on the court used from 1995 through 1997. The first 7,500 fans will also receive a T-Shirt commemorating the members of the 30th Anniversary Team. Tickets must be purchased through this website link or the button below. Tickets CANNOT be purchased from the PTA. Join us at Tijuana Flats on Monday November 26 and help us raise funds. 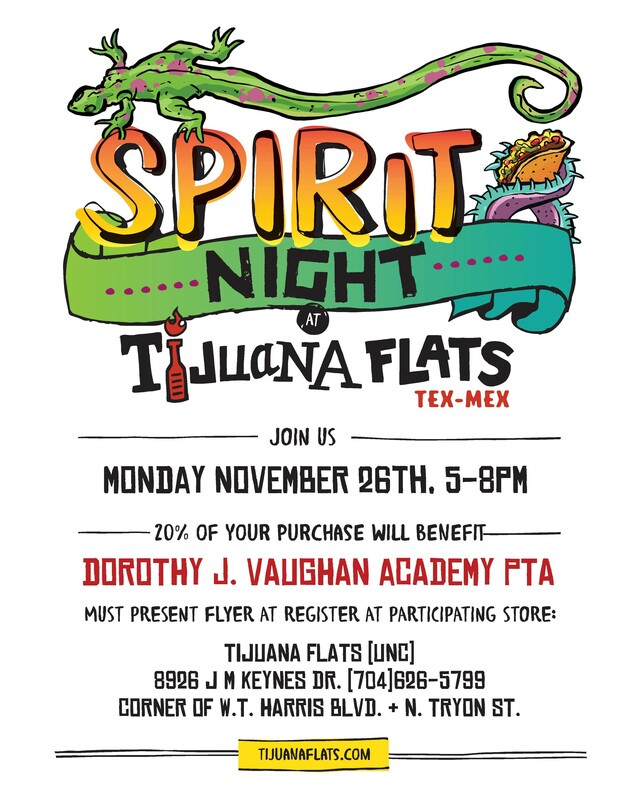 Present the flyer (in print or on your cell phone) and Tijuana Flats will donate 20% of food sales, excluding alcohol to our DJV PTA.